Award-winning sport and travel journalist Peter Smith is launching a new attraction in Birmingham called Wonderful World of Trains and Planes. An entrepreneur is hoping his brand new days out attraction will become Birmingham’s third biggest tourist destination within 18 months. Travel writer and marketing expert Peter Smith has flown 3,000 miles from his native home in Montreal, Canada, to set up a Birmingham transport utopia that will capitalise on his first love – travel. The embryonic, three-storey Wonderful World of Trains & Planes is already open for anyone who wants to go along to see how its first sets and models are being built. There are technical designs on some bare table tops and even mirrors underneath the stands so that you can see how it is being put together. “We will be fully open in time for the school holidays, but the Wonderful World of Trains & Planes will never be finished – will always be adding things,” says Peter, 67. Now renting a property in Handsworth Wood and expecting to stay for 18 months in the city that was once his home for 20 years, the former football referee has found two more non-Midland investors to back his vision. Tony Biddle, John Minards and Peter have together put up £250,000 for the attraction to get off the ground. It’s also a relatively modest sum considering the size, number and quality of the working models across 9,000sq ft of space. And the ambition to quickly become one of the city’s leading days out destinations. Once Trains & Planes has established itself by the end of 2015, Peter anticipates flying back to Birmingham for four, month-long stays per year. Nothing, it seems, is being left to chance in the three-storey building in Mary Ann Street, between Livery Street and St Paul’s Square. A cafe has been built at the back on the ground floor, making good use of the light bulbs that used to surround the mirrors in the former photography studio premises. And visitors will be able to have several hands-on experiences in what is intended to be a fun but educational environment. From seeing Thomas the Tank Engine to racing Scalextric cars and even using genuine flight simulator software to fly and land aeroplanes in cities like Las Vegas, there will be something for all ages. “We are hoping to join forces with the city’s two leading attractions, Cadbury World and Sea Life Centre, so that people who visit them for a half a day, might then want to come to us,” says Peter. Having begun his career as a journalist on the local Southend Standard newspaper, Peter says business success is all down to good communication. His career has included working for the NME, Radio Caroline, editing Thomas Cook’s business magazine and writing 36 books, beginning with a biography of John Constable in 1980. He was the UK Travel Writer of the Year in 1999 and European Golf Writer of the Year in 2002. “I’ve had parallel careers in marketing and journalism and it’s quite easy to do both. “It’s been a fun life – I’ve lived everywhere from Madrid to New York, West Africa, Sweden, Amsterdam and now Montreal, with 20 years in Birmingham along the way. “Looking back, the idea for The Wonderful World of Trains and Planes started when I was moving from country to country and I would collect various models. “I came close to buying a nice house in France, with a barn where I thought I could build a model railway. “Then I began to think of a place like this. “I’m interested in the history of railways which have had a massive influence on society in general. “We had them first to move goods around, then people. “Were it not for the line from Paris to Deauville, we might not have had the Impressionist painters. Just looking at the sinister black model train heading past an empty model watchtower is enough to send a shiver down your spine when you listen to this particular point. Peter also details how the 1902 New York Central Railroad heralded the use of what became known as “the red carpet treatment” later adopted by Hollywood. As a travel journalist, Peter has always looked at life from the viewpoint of his readers. “I was once given a tour round a major group’s hotel on behalf of a women’s magazine and was shown the mirrors and trouser press. “I said: ‘But where are the make-up mirrors – and irons so that ladies can iron their skirts. “Within two years, the hotel had installed them in every room. “It’s always the little things that make the difference. “We will have a story behind every train and plane and want people to come in and think ‘Wow, that’s fantastic’. 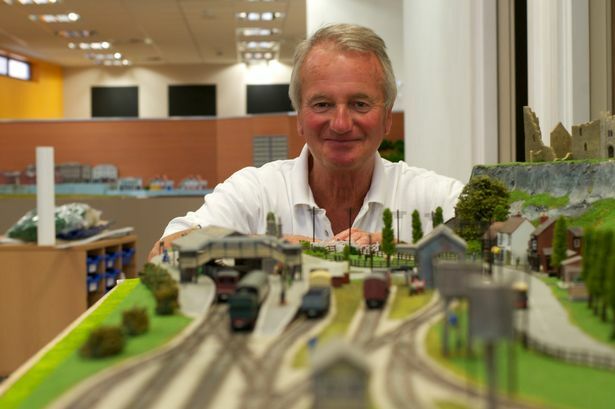 Peter is also keen to encourage modellers and railway enthusiasts to visit as soon as they can to admire the work in progress – and then, of course, to spread the word. Annual passes, valid until December 31, 2015, will be just £24 and entitle each bearer to special offers in what we also hope will be one of the biggest model shops in the Midlands. So why did someone so fleet-of-foot choose Birmingham for an attraction like this? Peter smiles: “I did live here for 20 years and it’s a good place to be based. “They reckon 37 per cent of the country’s population can get to the city in one hour. “It’s central and it’s thriving. “We could have done this in London and would have been a very small fish in a large lake. Is he behind HS2, though? “I’m in favour of railway development,” he says diplomatically.